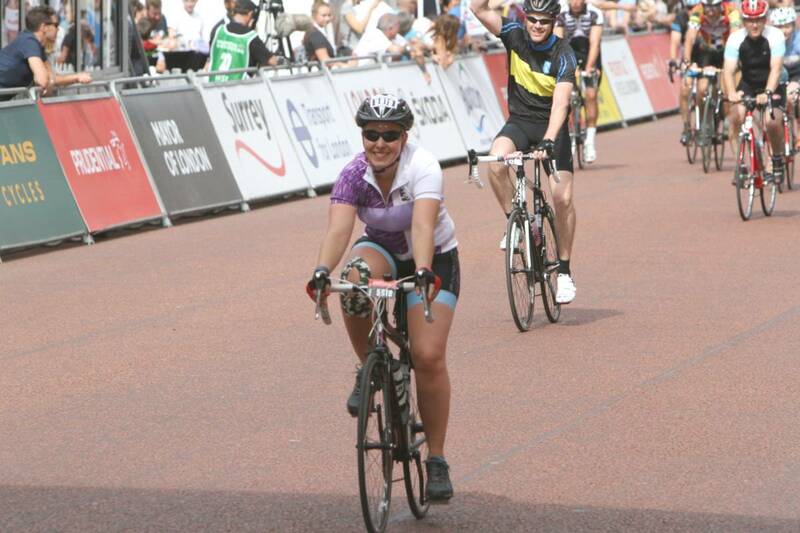 I think the above photo sums up my RideLondon experience quite well. 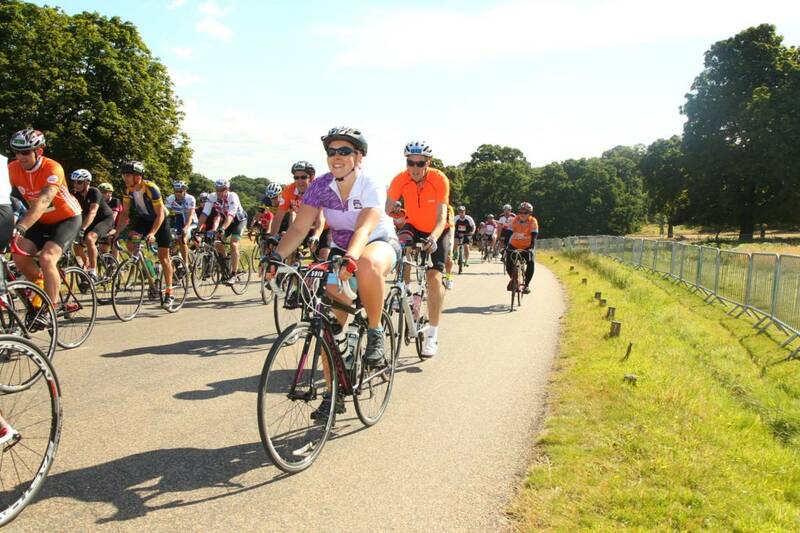 Sunshine, a massive smile on my face, surrounded by loads of other cyclists and just soaking up the scenery! 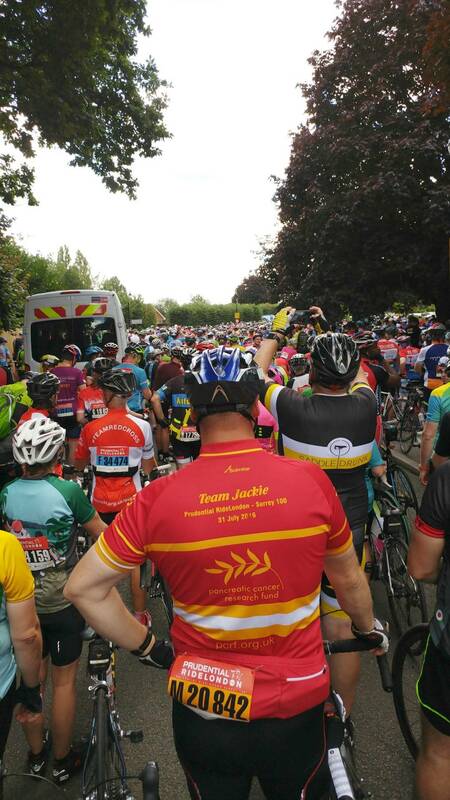 I probably spent a fair few miles on cloud nine, purely amazed that I could cycle so fast because of the closed roads – no stopping at junctions, no traffic, a mostly flat route and the adrenalin of race day having finally arrived! The lovely Mollie of PT Mollie offered for me to stay at her flat the night before, as she lives just a couple of miles from the start line in East London. This was a perfect setup and enabled me to get a relatively early night, minus the nerves and crazy dreams about already doing RideLondon and forgetting something terribly important! The following morning I got up just as Mollie and her husband were leaving for their early wave, ate breakfast (banana and peanut butter bagel) and cycled to the start line for about 7:30am. My wave time was 8:30am but I had to be in my “pen” by 7:49 (very precise) so allowed time to drop my bag, go to the toilet and get my gears tweaked by the start-line mechanic. Everything was so well organised, a slick well-oiled race machine complete with massive trucks that would drive our bags to the finish line to collect. At pretty much dead-on 8:30am I crossed the start line to the strains of “Things can only get better” and we were off! 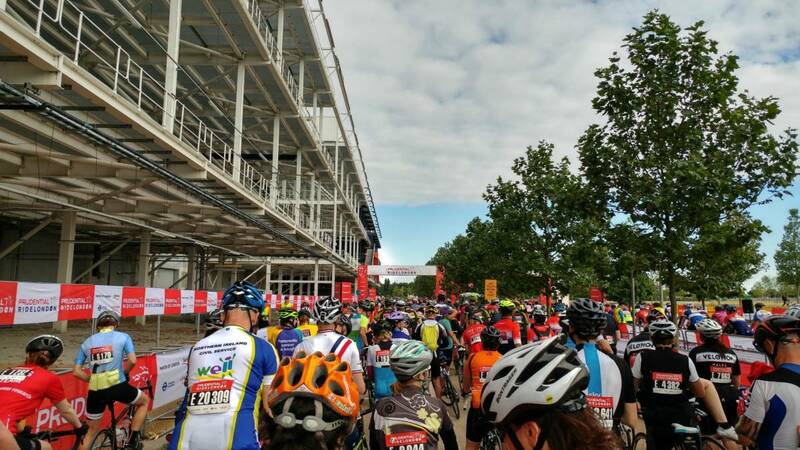 The over-riding memories from those first few miles was how bizarre it was to be cycling on the wide 3-lane motorways through London, hundreds of cyclists on either side, and no cars in sight. Going through the tunnels with the green lights glinting eerily in my sunglasses and hearing only the swish of pedals was pretty surreal. The Prudential RideLondon-Surrey 100 course heads out from the Olympic Park through Central London to Chiswick and Richmond Park. 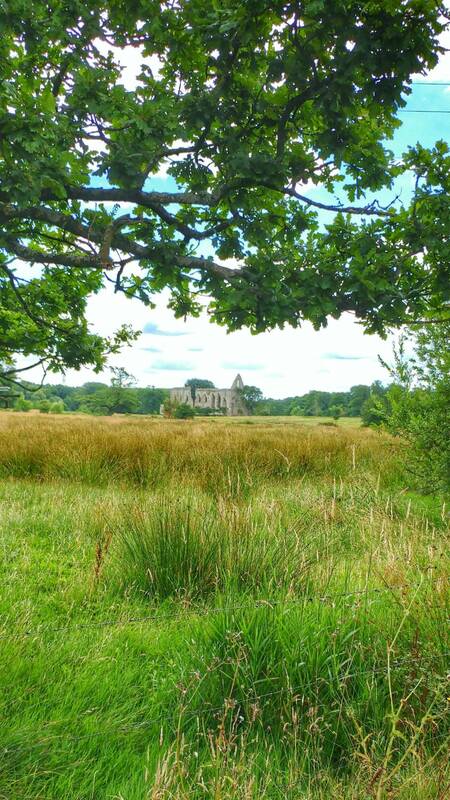 Here was where I decided to take my first stop, at about 20miles, having been advised that the first Hub offering food at 25miles was likely to be really busy. 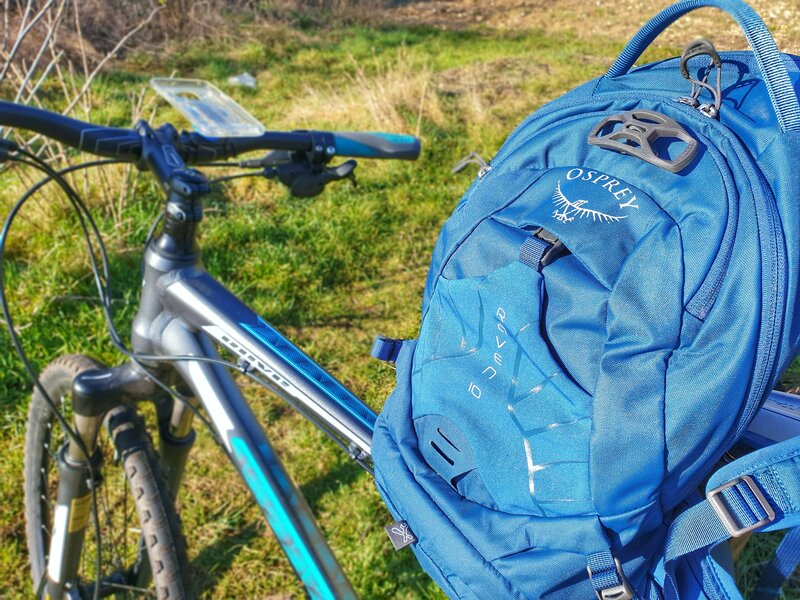 There were however numerous drinks stops along the route, so I was able to eat a CLIF bar from my jersey pocket, stretch and head back out through Kingston, Walton-on-Thames and along to Weybridge – an area I know pretty well having lived there a few years ago. This was where I encountered the first of the accidents that affected the race last weekend, causing a small bottleneck at around 30miles. I walked for about 5-10minutes past the ambulance before being allowed to remount and ride on. Unfortunately, 6 or 7 miles down the road another accident had led to a much bigger crowd of people held up. I ended up walking for 45minutes to an hour, shuffling slowly along the road with the crush. 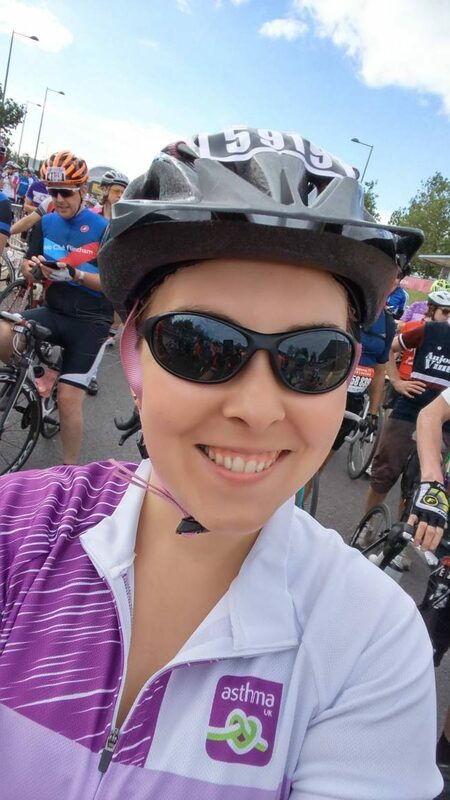 The atmosphere was generally really positive though – by coincidence I’d ended up cycling with a lady called Carla who was raising money for Breast Cancer Now. We fell into sync very soon after setting off and despite my stop in Richmond Park and hers in Kingston to see her family, we met up again and stayed together until after the second accident bottleneck cleared. It was lovely to have someone friendly to talk to. The miles flew by while we were chatting and even when we were starting to get frustrated by the hold-up, and the increasing probability that we would get diverted to a shorter route, we were taking selfies and sharing jelly babies and generally having a good time! 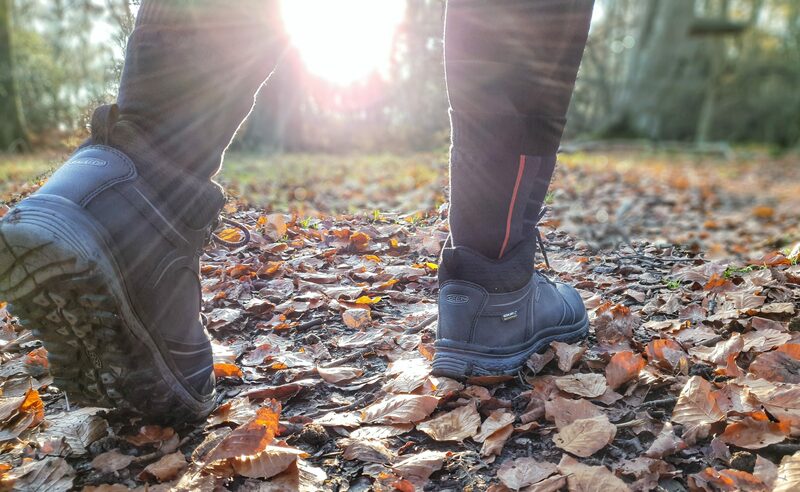 Hearing people clip-clopping along the road in their cycling shoes sounded so funny in the peaceful Surrey countryside too, although it did make me very glad of my flat soled cycling shoes that were a lot more comfortable to walk in. 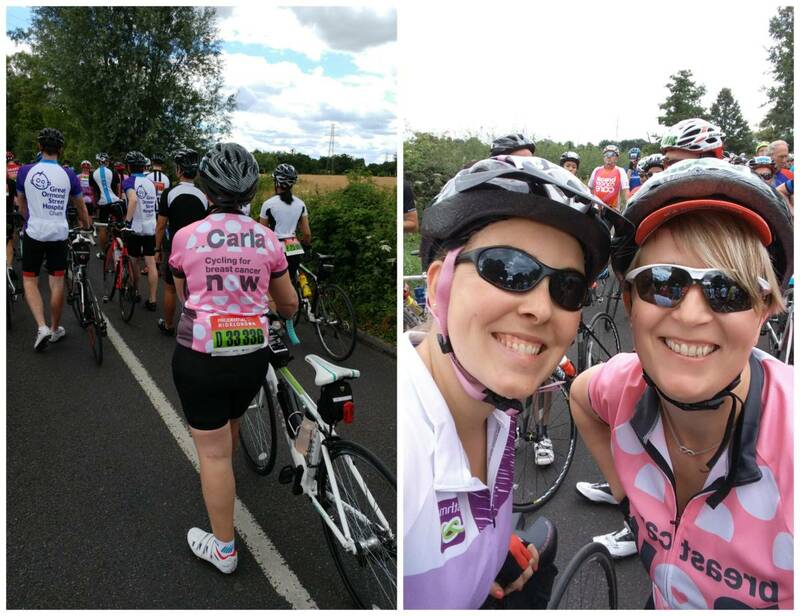 When we finally got moving, unfortunately there were so many people trying to get back on their bikes and get cycling again that I lost Carla in the crowd – I would love to know how she got on! 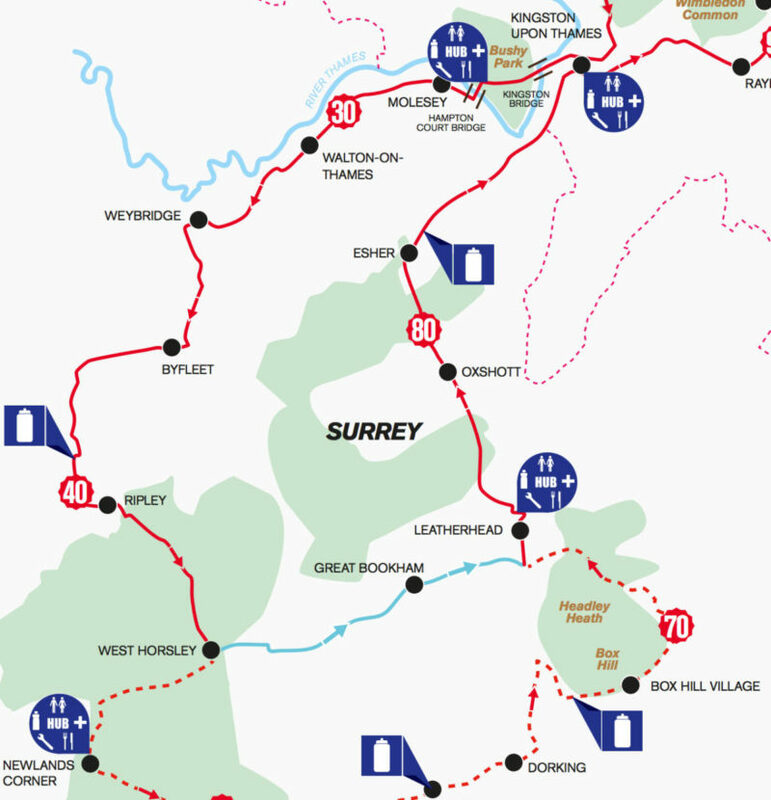 So yes, we did indeed miss the cutoff time at Newlands Corner and were diverted straight across to Leatherhead, missing out the middle part of the course that encompasses Leith Hill and Box Hill. This is basically the hilly section of RideLondon 100 which is probably why I felt so good at the end, as I had essentially just cycled all the flat bits! And I was a little disappointed not to at least get to attempt Box/Leith Hill but when we saw the air ambulance and heard about the serious nature of the accidents, I didn’t feel justified to really complain. I stopped at the Leatherhead Hub to go to the toilet – standing in the sun waiting for ages had made me drink a lot! – and to grab a few different snacks. 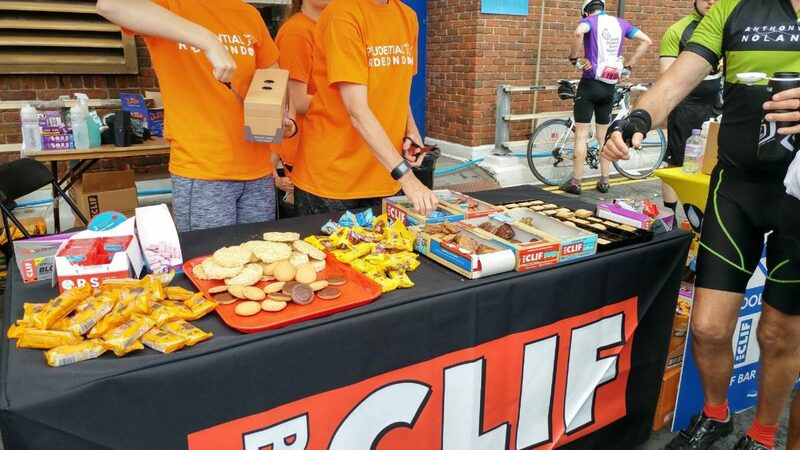 As well as CLIF bars, gels and shot bloks the fuel stands had jaffa cakes, fig rolls, soreen malt loaf, crisps and a whole host of other food. I probably ate a few too many different things and gave myself a bit of a stomach ache for the next few miles, but it was fun to mix it up! I’d been eating a lot of shot bloks while cycling as I could empty the packet into my jersey pocket and grab them easily. Heading back into Kingston the crowd support was once again amazing. This part of the course sees riders pass by twice, on the way out into Surrey and on the return journey, so is a great place for spectators. 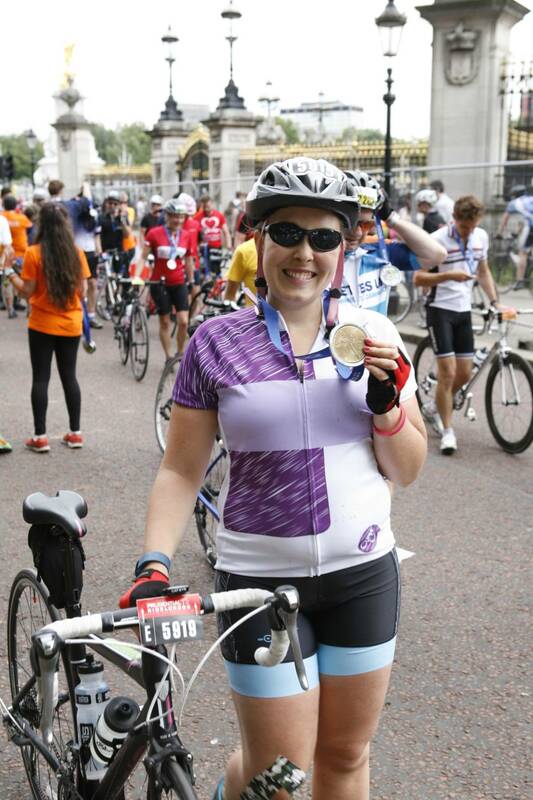 I loved hearing all the cheers for Asthma UK as I cycled past! The support was generally great on the whole route – while we were held up in Ripley people were coming out of their houses with hoses and jugs of water to make sure we all stayed hydrated, and further along the route I got goosebumps when people on both sides of the road broke into “And I will walk 500 miles” singing along to a sound system set up outside someone’s house. I stopped at the Kingston Hub to refill my water bottles one final time – and to see my support crew 😉 Then it was just the last few miles to tick off back into London- the final hill up into Wimbledon, then over Putney Bridge and along the river, and before I knew it I was cycling past Trafalgar Square, under Admiralty Arch and down the Mall with Buckingham Palace in the distance. A pretty spectacular way to end my RideLondon 100 80! My bum was quite glad to leave the saddle (!) and walk along to collect my medal, goody bag and retrieve my baggage, but my legs felt surprisingly good. Tired but no annoying niggles or twinges which was great! 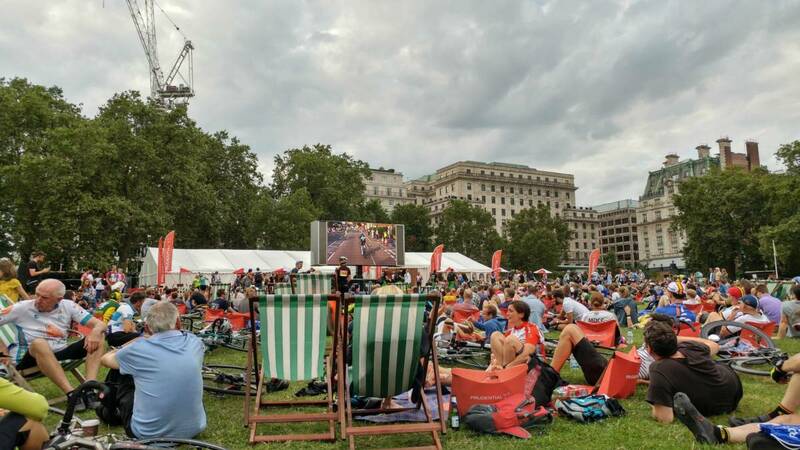 I made my way to Green Park to the Asthma UK stand to meet my support crew – we found a deckchair in front of the big screen watching the pros smash the distance in half the time I did, while I inhaled some fish and chips and admired my huge medal! When I think back to how nervous I was to receive the “Yes” magazine through in the post in February, and how excited and happy I was on Sunday afternoon it honestly feels like two completely different people! I never thought I would end up loving cycling so much, or that my confidence would improve so dramatically in such a short space of time. I will definitely be putting my name into the ballot on Monday for next year, and hoping that I can come back and attempt the full 100 miles! Looks like it was a great atmosphere, despite the accidents and subsequent hold ups. Yeah, the atmosphere was amazing – both from the spectators and the other people taking part! Well done Beki! Knew you could do it! Enjoyed reading your recap! Awesome awesome awesome. 80 miles is a ridiculously long way. RIDICULOUSLY. Amazing.